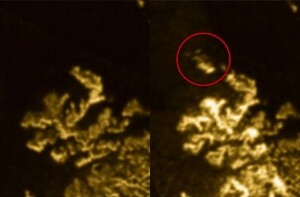 Apparently Saturn’s moon Titan has been manifesting a disappearing island. NASA’s Cassini spacecraft has been keeping on an eye on a feature that has appeared, disappeared and then reappeared with a new look. First spotted in radar images in July 2013, the “magic island” is the subject of much speculation. An image of the area from 2007 shows just a dark, empty space. The most recent image, captured in August of this year, show the mystery feature looking both a little dimmer and little more filled out than it did in 2013. Scientists have ruled out evaporation in the sea causing the appearance of the feature, since the nearby shoreline has not changed. Possible explanations include waves due to rising winds, gasses bubbling up, solids floating to the surface, or solids suspended just under the surface. NASA is also leaving speculation open to include “something more exotic.” An extraterrestrial submarine piloted by Elvis would fall under this designation. Whatever it may be, the further we go in exploring even so little (on a Universal scale) as our own solar system, the more mysterious and strange and amazing our Universe becomes.